The cloud wars are full on and everybody want a pie of the multi-billion dollar cloud storage industry. Almost every company in this industry is offering free cloud storage to lure customers. The free storage offered by these services is quite sufficient if you are a normal user using it to save a few photos, mp3s or videos. But, if you are one of those power users who need to store 1000’s of files and GB’s of data you could very soon run out of the free storage offered by these cloud services. 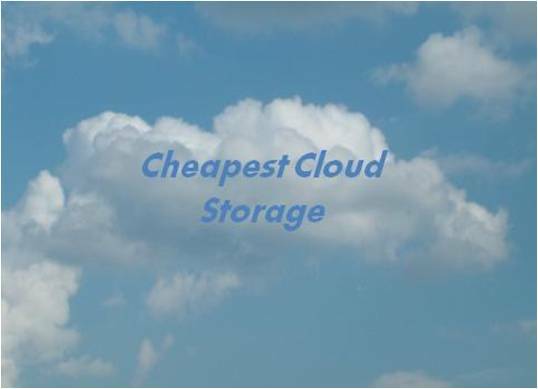 There are a plenty of companies out there that offer cheap personal cloud storage plans if you ever run out of the free storage and need additional storage. Since our data is very precious, we can easily rule out the lesser known or unreliable players and just stick with the top guns in the personal cloud storage industry. Listed below are the top 5 cheap personal cloud storage services. 3. Copy: The best thing about Copy is that you don’t really need to upgrade to paid plans if you are a good marketer. Copy provides you with 15 GB of free cloud storage when you sign-up for its service and a good 5 GB thereon for every friend you refer to the service. If you are one of those lacking in these particular skills you could still buy storage from them at $9.99/month or $99/year for 250 GB and $14.99/month or $149/year for 500 GB. 4. Mega: Mega is based in New Zealand and it stresses more on the privacy of your data. It offers 50 GB of free cloud storage and you can also upgrade to a Pro account by choosing between three different packages. The PRO 1 package costs 99.99 Euro/year for 500 GB, the PRO 2 package costs 199.99 Euro/year for 2 TB and the PRO 3 package is the cheapest on per GB basis at 299.99 Euro/year for 4 TB. 5. ADrive: ADrive already provides its users with a handsome 50 GB of free cloud storage which should be sufficient for a majority of its customers. It also has affordable plans for additional storage in case you need it. ADrive plans start from $2.50/month or $25/year for 100 GB. You can choose to have upto 10 TB of extra storage if need be. The cost per 1 GB of storage is 25 cents/year. Apart from the above services, there are also many other popular cloud storage services like Dropbox, Box etc. which provide additional storage on payment. These plans are slightly on the higher side and are bit heavy on the wallet for personal use. The above mentioned cheap cloud storage services find the right balance between price and the ease of use. Next post: How To Get 10 TB Free Cloud Storage From Tencent Weiyun? Previous post: How To Pay For Friends/Family Members Subscription On WhatsApp? Also thank you Anita, I will be checking out Dupplica too. Again , I want to thank Anita. its fast and after a week I got my 800GB up there. I would stay away from Bitcasa, the fact that they went from $10 / month to $99 / month for unlimited cloud space is sketchy enough. I thought that they would at least honour all their old users who are still at the $10 / month rate and out of the blues they said to all of us that we had till the end of the month to get our files downloaded or risk loosing it if we don’t upgrade to the $99 / month package.